Jypyä Pop (Turku, Finland) on 30 April 2012 in Animal & Insect and Portfolio. Great shot! So full of action. @ursulakatariina: It is a spring now. Quite a splash - perhaps a spectacular landing? @Stephen: I believe that it is going to girl-boy-stuff. It seemed that the nest would have begun to build, but its inhabitants had not been decided yet fully clear. What's in front of him? Another Coot? @CElliottUK: It was going to dispute as to who is to build a nest, and with whom. TRès belle photo! j'aime le mouvement de l'eau!!! @Martine: It will move the water when two suitors one to litigate over the bride. A wonderful capture......love the action in this shot. Great capture ! Beautiful ! Quel captage avec ce battement d'ailes dans l'eau sueprbe. @Nicou: Sometimes it is good luck that sees such a case. Spring makes the young gentlemen a little restless when the girls are close. @Adela Fonts: Hi Adela. Yes, there were practical problems caused by the Romantic match the popularity of the girl. It will happen here as well in that cold in the north corner of the country. Thank you and good spring for you. @Baldwin VW: Picture shows how the dispute took place in nest location and partner. Not yet on it at a time become clear. That bird is a coot nokikana. Some of them winter in Finland and in part to change a bit further south. 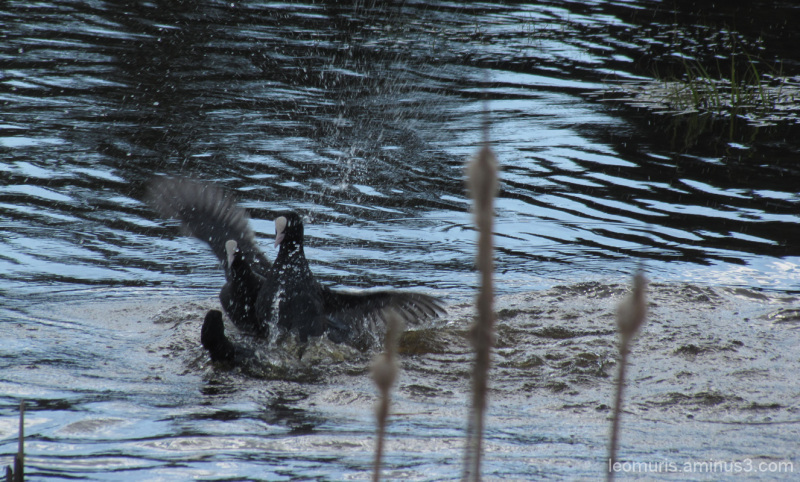 Coots do seem to do a lot of fighting but they are good parents.